The restoration was essentially based on a rejection of the creeds of Christendom which were declared “an abomination” and “those professors were all corrupt; that: ‘they draw near to me with their lips, but their hearts are far from me, they teach for doctrines the commandments of men, having a form of godliness, but they deny the power thereof.” So, are all creeds bad or just those specific creeds? Are there creeds in Mormonism or is it a creedless religion? 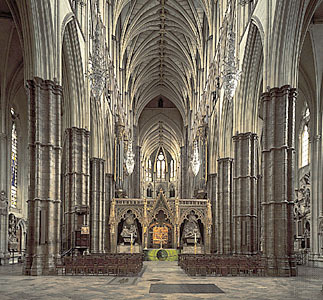 Over Christmas, I was fortunate enough to be able to attend an Evensong service at Westminster Abbey. It was very cool to be in a worship service surrounded by 3000 of England’s most famous dead people. The choir was far superior to anything I’ve heard in any of the wards I’ve been in, although the songs had that quality of being made up as they went along (but in Latin). Part of the service was the recitation of the Anglican Creed. I could have in honesty recited 80% of it without batting an eye, but there were some statements in it that I could not in good conscience recite (but then I’m not an Anglican, am I?). Consensus. Too many cooks spoil the broth, as they say. Groups of people haggling over the nature of God is likely to lead to debates full of compromises and competition, not actually nailing down the nature of God. Limits of Language. Regardless of how precisely we try to communicate, words have mutliple meanings and are subject to individual interpretation. Context of Culture & Time. Over time and in different cultural contexts, the meaning of words changes. Conflicting Opinions. Q: When two authorities disagree, which is right? A: The one who agrees with you. Prophetic Fallibility. Q: When is a prophet not speaking for God? A: When he’s proven wrong over time (or see the first answer). In Writing. One could say that creeds are bad in that they are written down at a point in time based on one’s understanding, but they could be incorrect or need revision at a later date. Being written down causes people to stop seeking revelation and to continue to reinterpret the same dead words on a page. Creeds in general are rejected because they hem the church in rather than allowing it the freedom to reinterpret itself through greater light and knowledge. I suggest that there are two main creeds that have crept into Mormonism: the Articles of Faith and the Proclamation on the Family. I considered and reject that the Official Declarations are creeds (they are more like one-time memos). I also reject the scripts in the temple as “creeds” of a sort because they change considerably and frequently. The Articles of Faith were written by JS in 1841 (in a letter written to John Wentworth published in 1842 in Times & Seasons) to explain what Mormons believe. The Proclamation on the Family was published (to the world at large) to explain what Mormons believe about families and responsibilities. Are they creeds? And if they are creeds, do they have any of the 3 problems listed above? So, if we dismiss the idea that authority is a problem (for those who are Mormons at least), is there a problem with either content or with the fact that they are in writing? First of all, let’s consider the ubiquitous Articles of Faith. What Primary child hasn’t memorized these basic, irrefutable tenets of Mormonism? Surely, their content must be above reproach. Or is it? Here’s a counter-point on the Articles of Faith, excerpted from here. Actually, the truth of the matter is that the Articles of Faith are remarkable for what they fail to say concerning the teachings of the Mormon Church. Although Joseph Smith was practicing polygamy at the time he authored them, he made no reference to the doctrine of plural marriage. He made no mention of his teaching that there are many Gods, that God was once a man or that men can become Gods. The Articles of Faith are completely silent concerning the Doctrine and Covenants which contains many of Smith’s revelations and distinctive doctrines. Even Apostle McConkie had to admit that these “articles, of course, do not attempt to summarize all of the basic doctrines of the gospel…. the Articles of Faith are silent on such things as celestial marriage, salvation for the dead, temple work in all its phases, the resurrection, and degrees of glory in the eternal worlds.” (Ibid.) The Articles of Faith seem to be an attempt to hide almost all of the LDS teachings which separate the Mormon Church from historic Christianity. So, it would seem that the Articles of Faith might be said to suffer the same basic problems of all creeds: content, authority, and being written at a fixed point in time. Perhaps these are issues that all scripture face as well. But are they an abomination? More or less of an abomination than the Creeds of Chrstendom? Do you agree that these are creeds of Mormonism? Do they lead to the same sorts of problems that other creeds do or are our creeds OK, but others’ are not? Discuss. Polygamy was never in a “creed” so when that changed…big deal so what? The temple scripts change but are not in the articles of faith again – and? Much like asking someone to work out the area of a triangle without being able to work out 3 multiplied by 4. ANYTHING of such magnitude as deep doctrine can only be learned after learning some other things like Heavenly Father has a body and HF Jesus and the Holy Spirit are three totally seperate entities! Just for the record, Hawkgrrl, you should really try Evensong at St. Paul’s–the acoustics are far better than Westminster Abbey, and when my wife and I went they surprised us with a gorgeous rendition of Kingsfold ( http://www.youtube.com/watch?v=jd7nT8sDrZk ). I’ve also heard St. Martins in the Field has a very good organ and choir, though they were closed for construction when I was there. The ninth article of faith basically says this is just the beginning and may be adjusted over time. God will yet reveal many great and important things pertaining to the kingdom of God. This basically shoots Sandra Tanner’s statement dead in the water. It is the key to why the AoF is not a creed. I think the plan of salvation or plan of “happiness” qualifies as a creed. It’s taught as the first lesson in seminary for the year, is mandated as a part of every funeral service, and is the foundation of the temple service. I expect that every member could give a brief synopsis without any difficulty. In short, may I suggest that Ms. Tanner yank the plank out of the creeds she compares the AoF to before attempting to tweeze Joseph Smith’s work. Fair points, all, about Ms. Tanner’s perceptions being a little skewed. That being said, though, my main point is that when we substitute one set of creeds (even if they aren’t really creeds) for another (the “abominable” ones), we do ourselves a disservice. The greatness of Mormondom is, IMO, what is pointed out by Doc – “to be continued . . .”. The BY quote is great, too. Hadn’t heard that one before. There will always be those within the church who want to close the canon, who will try to nail things down that should be left open. Those are my concerns with treating the AoF or the PoF as Mormon creeds. Perhaps someone knows more early Church history and can rebut this, but I’ve never understood the verse you mentioned in Doc&Cov about creeds being an abomination to necessarily imply that ALL creeds are an abomination. Rather, I understood it to imply that those used in Christianity were an abomination because of their incorrect doctrines and rigidity, and that a correct or true statement with the same title of “creed” need not be abominable. In other words, I don’t think God hates all mission statements–just mission statements that prevent His children from coming unto Him. There is an important distinction that is often overlooked by Mormons when approaching the creeds: they are statements of orthodoxy not statements of doctrine. They describe which beliefs are “correct” and, in this way, set up walls around belief. They are not revelations, except that many Christians see the councils as inspired in their actions (much as we believe that the General Authorities, when united, are inspired even though they are individuals with differences of opinion). The classic creeds do not limit revelation, only belief. The main difference I see between the later creeds and the AoF is that nobody in the Church is usually excommunicated for private disbelief in any or all of the AoF but rather for their actions. However, in defining orthodoxy, the AoF are definitely a creed in my book. Can it be a “creed” if it is cannon, i.e. “scripture”? The articles of faith are canonized as part of the Pearl of Great Price. Also, just my two cents. . .I think we should canonize the Proclamation on the Family. . .not like a OD, but as a section in the D&C with verses and all. I have always viewed creeds as statement of essential doctrines that must be believed by a particular faith group or religion. They outline the nature of God, humankind’s relationship with God, and outline a plan whereby humankind in their imperfection can reconcile themselves to God’s perfect nature. Only the most essential elements and historical events are included so as to provide a base upon which all can agree. In this context, AoF 1-4 essentially accomplish what the Nicene and other creeds do by stating belief in God, proclaiming the need for Christ, and outlining the components of Christ’s gospel whereby humankind is reconciled with God. All the other Articles of Faith add extra context for a Mormon understanding of other Christian principles such as church organization, priesthood authority, canonized scripture, operations of the Holy Spirit, millenarianism, agency and freedom of religion, and espousing ideal character traits. IMO they are extra-creedal. If we are going to interpret the AoF as a de facto creed for Mormonism, it accomplishes more than other creeds set out to do by including more elements. While certainly the Catholic, Anglican, Protestant, or other creedal churches have doctrines that establish orthodox beliefs for each of the topics covered by AoF 5-13, the fact that they don’t make it into an official creed is telling of what a creed might mean, and how it operates for these organizations. Perhaps the detail of the AoF contributes to the perception by outsiders that the LDS church overreaches in its conception of Christianity to include elements not considered core or essential. Similarly, the Family Proclamation could be seen as overreaching as a creedal document as well. After it helps delineate humankind’s relationship to God and showing how the concept of the family is integral to the reconcilation of humankind with God, it continues on to include proscriptions and counsel about how families ought to be formed and managed, and about how families ought to operate in society. Here, the Proclamation leave creedal territory. Nevertheless, the document is received as a whole, and has taken upon itself a rather creedal-like function in practical usage (I know of a fair number of people who have memorized it, and have encouraged their children to memorize it as well). It could be yet another example of how Mormon’s seek to go above and beyond the basic elements of core orthodox belief in their statements of belief. Statement of belief in God the Father, Jesus Christ, and Holy Ghost as perfect, eternal, beings. Statement of the relationship of Jesus Christ to God the Father. Statement humankind’s relationship to God the Father and Jesus Christ. Statement of Christ’s mission to redeem mankind from the Fall, and basic historical events that accomplished that reconciliation (divine birth, perfect life, atonement, crucifixion, death, resurrection, ascension). Statement of Gospel plan (faith, repentance, baptism, gift of holy ghost, other ordinances(are there truly any?) necessary for salvation in preparation for future resurrection, judgment, and inheritance of glory. Perhaps a statement of the relationship of families in God’s plan of salvation. Statement of faith in the Church as God’s organization or kingdom on earth. It doesn’t sound much different than the Nicene creed to me. Why? because the essentials of the Gospel and our conception of God are the same, barring minor squabbles about Original Sin, Trinitarianism, and post-mortal living arrangements. Why wouldn’t stuff like priesthood ordination and temple ordinances make it in? I suspect because those are not universal requirement for salvation: women do not currently get ordained to the priesthood, and whereas we believe that temple work must be performed for everyone who has ever lived, we are not absolutely required to obtain those ordinances during our lifetimes. Indeed, many never have that opportunity. Why wouldn’t “enduring to the end” make it into a Mormon creed? I suspect because it is still unclear in our theology how works and grace operate in our salvation in the ultimate sense. Why wouldn’t statements like AoF 13 fit? Perhaps because people of other faiths, or people of no faith believe in attaining those character traits as well, so they really don’t set one apart from others very effectively, or act as requirements for reconciling onesself with God. Sorry for the long comment. Cheers! PaulW (#10): Just my opinion here, but I’m guessing it will be a long time before the Family Proclamation might become part of the official canon of the church. Why? I think there is too little clarity right now on issues of gender and sexuality in the Church vis-a-vis social definitions of roles and relationships and actions, as well as vis-a-vis scientific understanding of their nature and operation upon individuals. Up until recently, for example, homosexuality was viewed by the church as an aberrant psychological condition that might be able to be overcome, similar to alcoholism. And I would argue that up until the women’s movement of the 1960s, women were assigned to a much more subservient role in family relationships, and played very small roles organizationally within the church. As society ans science reconsiders gender and sexuality, so does the Church. While the Family Proclamation seems to draw some lines in the sand, theologically speaking, the Church could come to disavow some of them if they continue to reenvision the role of women and homosexuals in the Church, as they have done in the recent past. Adding something to the canon, and then rescinding it later would be like egg on the Church’s face, especially since the Church claims ongoing divine direction. One of the AoF that I remember being perturbed by as a Primary child was the first one because it doesn’t specifically state that we believe God has a physical human-looking body or that we are His literal children. It sounded like all other Christian churches’ beliefs without including any of the cool ideas that are more unique to Mormonism. There’s nothing incorrect in it, but it seems incomplete. Like SteveS, I think the PoF won’t stand the test of time possibly due to the constraints of language. The language around gender is evolving right now. It will be very difficult to express ideas about it in a way that will sound right in 20 or 50 years. Best to wait for PoF 2.0 IMO. One of the AoF that I remember being perturbed by as a Primary child was the first one because it doesn’t specifically state that we believe God has a physical human-looking body or that we are His literal children. It sounded like all other Christian churches’ beliefs without including any of the cool ideas that are more unique to Mormonism. Wow. I don’t remember being perturbed about much of anything in primary beyond the length of the meeting and that I had to wear church clothes. Late bloomer, I guess. Thanks Ray. I’ll check it out. Scott – “Wow. I don’t remember being perturbed about much of anything in primary beyond the length of the meeting and that I had to wear church clothes.” I was just an easily perturbed child. But I was almost a teenager when I had that thought. We didn’t learn them until right before we aged up. But I was almost a teenager when I had that thought. We didn’t learn them until right before we aged up. I was such a charlatan in primary. I remember being told that, before I could graduate from primary and move on to YM, I would have to memorize the AoF. I hedged on their lack of time for testing and memorized only the last AoF. When the big moment came, my guess proved brilliant and I only had to recite the last one. Looking back, though, I wouldn’t have memorized any of them. Honestly, what were they going to do? Keep me in primary? Oooh…scary.